Ever wanted to train with a professional sports team? Well now you have the opportunity, kind of. FCB Fitness is a new application designed to help you turn yourself into shape by hitting targets designed by physical fitness and sports experts. The app is backed by FC Barcelona which is a good initiative especially targeting a younger generation, as all circuits and exercises are revolved around one of the players. As you complete your routines, you earn rewards and the app will track your progress from the first day to training right up until your last one. Each week you receive a new challenge created for your specific goal and it helps to push you to your limits. It is full of recommendations, offering you information as to the best training times and proper recovery periods, again provided by physical trainers. FCB Fitness also incorporates social networking to offer that competitiveness needed to keep upping your work out against your friends. This can be recorded buy the amount of rewards and points you receive by completing your challenges. 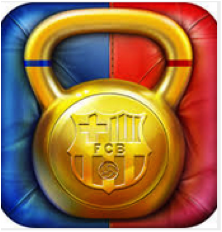 On the whole, probably not too different from other fitness tracking apps, although a clever piece of marketing could prove all to well to be the difference, for the simple face Barcelona is a global brand already well recognised by almost every community.